June has been a transition month. Spring to summer, no more school, morning practice turns from a half hour early in the morning to an hour or two when I am more awake, and the best of all are the outdoor shows. I love playing music outside when the weather is nice. It was always so appealing to me to see concerts in outdoor venues and it is even more appealing to play in them. There are a few lined up this summer that I am very excited about, including the Top of the Park in Ann Arbor and the Crossroads music Festival in Ypsilanti, both with Dave Sharp. I started the month off with a gig that stretched all the way to the brink of my comfort zone. It was with a well known Indian vocalist named Sugata Marjit. I was contacted by the Center for South Asian Studies to play the show and I couldn't pass it up. But as soon as I said yes I recalled the words of my guruji, who said, "The only type of music a western tabla player would have much difficulty accompanying would be vocal music, especially if you don't understand the words that are being sung." He told that to me in a casual conversation in the car a few years back, but it hit me like a hammer when I realized that it was exactly what I was about to do. I must say, it really put me into the mode of some serious practice, which was much needed considering I have not seen Guruji since last September. Honestly though, I really did not know what to practice. I think I was more preparing myself to 'go with the flow' and follow anything he might do. I did a lot of vilambit ektal, which is an extremely slow 12 beat cycle, (it takes like a minute to get though one cycle!). This was a hallmark of his style of singing which is known as Khayal. When I got to the theater, (it was at the U of M music school), I met him and we had about 20 minutes to go over what we might do. He tried me out on the vilambit ektal, but I was not able to play it slow enough, so he, being very kind hearted and easy going, said, "No problem, let's just do something else that you are comfortable with." I was humbled and happy to hear that. I have always said that the best musicians are the ones that know when to push you and also when to back away and let the music be good. He was one of those musicians. We had a great time and there was a really nice crowd there. I was happy to be joined on stage by Atmaram Chaitanya on tanpura. He is such a calming presence, while at the same time his excitement to be in a new situation is infectious and almost child-like in it's innocence, and I mean that in the best way. I get energized by this and it is much appreciated. I played as simply and nicely as I could. I had a great time watching him perform because he is so expressive when he sings. By the way, none of what we rehearsed before the show actually made it into the show itself. 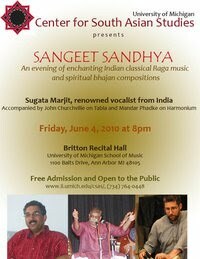 True to the improvised nature of Indian Classical music, Sujataji called out something different every time we played, it did not matter if we were rehearsing with just us in the room, or if it was filled with people, once a musical experience was had, it was time to move on to the next one. He kept it pretty simple, just tintal, (16 beats), but he did do a slow japtal, (10 beats), which pushed my comfort zone just enough. I relished in the fact that I was the young guy on stage who had a lot to learn, even after hundreds of performances and 11 years of studying the tabla. I truly believe it is necessary and good to push yourself beyond what you are comfortable with just to see what might happen. Sometimes you fall, but more often than not, you simply get a renewed energy with a broader perspective on where it is you are headed. Just two days later was a completely opposite, but equally rewarding event, it was my student recital held at Go Like the Wind. What was completely different compared to past recitals was that this recital was almost all tabla students. Just one student who played the conga, but no drum set students. I am not sure why this excites me so much, I mean, I love the drum set and I love teaching drum set, but to have a recital with all tabla players just seems so cool. I think it also has something to do with the set up time and involvement when you have a drum set recital compared to a tabla recital. Usually, with the drum set comes a guitar, bass, and/or keyboard, along with the amps and sometimes a microphone. With tabla I just need to bring my drums and a carpet. So nice. This gave me more time to hang with the students, help calm nerves and meet with the friends and family. It went great, and I am so happy to see everyone together doing so well and playing this beautiful instrument that I have loved for so long now. Meeta Banerjee, Dan Piccolo, Anoop Gopal and myself. I remember looking over at Dan and just seeing him squinting almost in pain. Luckily we just had to play a half hour after the walk was over, so we didn't get fully cooked. It was actually nice to play for a good cause and I got to meet the Mayor of Ann Arbor John Heiftje, who was there to make a speech and cut the ribbon that started the walk. He was a nice guy and I really liked that he rode his bike to the event. So later that evening, in a cool, air conditioned tearoom we had the same crew, with Atmaram, Mahesh Ganesan and Dave Sharp added to the mix. It was a fun night. We tried a totally improvised piece with percussion and bass that was incredible. Dan played the cahon, Mahesh was on his kanjira, and I played the tabla. It was one of those things that made me wish I had been recording, but since I wasn't, it was incredible to take in and be a part of. It epitomized the whole reason for Indian Music night and inspired us to take more risks. As always, the crowd was great and the whole night went by way too fast. The following Friday was the monthly kirtan at the Friends Center in Ann Arbor. It was a beautiful night of chanting and I was enjoying the music, but at the end things got crazy. The wind started howling, lightning started to crash and the power started cutting in and out. All of this happened at the last chant. Usually we do a 10 minute silent meditation at the end, but it had to be cut short because the power was out and people were getting a little uncomfortable knowing they were about to go out in the midst of all this natural chaos. I believe this is the third time the kirtan has ended with some major weather event like this....coincidence? The next day I was back on the drum set with the Nick Strange Group. This time we were in Ypsilanti at the Tap Room Annex. It was a nice room to play in with a little stage and lots of room. The crowd seemed to like the music and we had a special guest sit in with us. He is a well known saxophonist in the area named Martin Simmons. I loved it, he came in the door with his sax already around his neck. 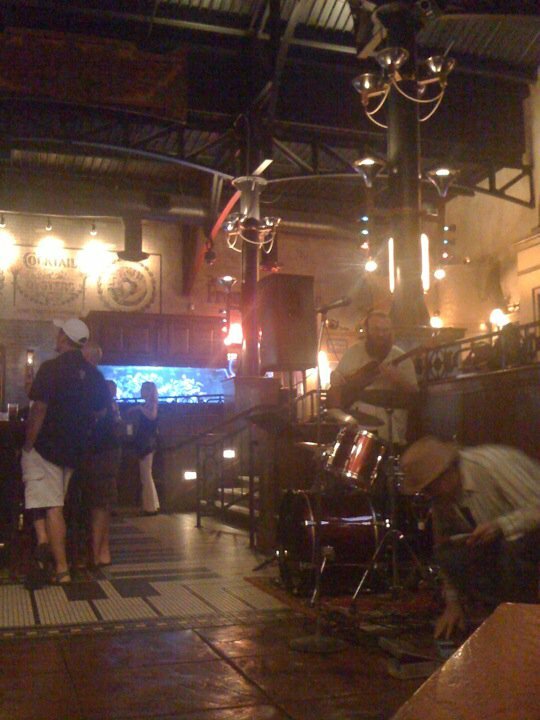 He had been walking around downtown playing with other groups at other venues, playing on the street, and now with us. It really felt like a great 'community' moment. I guess he just decided to make a open mic night out of the Ypsilanti music scene. Not many people can get away with that, unless you are well liked and well known in your community. The whole next week I was back at GLTW for a morning hand drum camp for 3-9 year olds. I have been doing the camp for about 5 years now and it is one of the cutest things I do in music. Seeing a 4 year old close their eyes and 'go for it' on a drum is so darn cute. I spent the whole week smiling. It was a great way to start the day. That weekend I was packed with gigs. 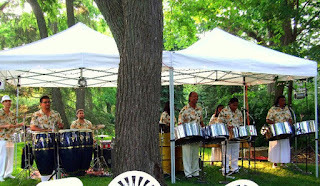 First was with Gratitude Steel band at a private wedding party in someones beautiful backyard in West Bloomfield, MI. The band was really rockin. We had 5 pan players, plus a timbale maestro and a great conga player. I have said it before and I will say it again, playing with that band is like playing musical sunshine. I love the music and the sound so much. It is like a warm hug of sound that I have never experienced before with any other group. 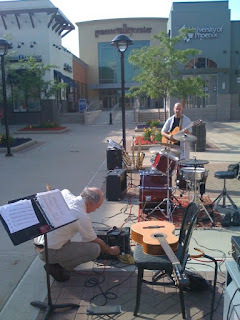 The next day I was in the sun again, (though not nearly as hot), with Deep Blue at the Genesee Valley Mall up in Flint, MI. It was nice to play with them again and I love to people watch. We had some regulars in the crowd who I found out were mall employees that loved to take their breaks out by the live music. It made me feel good to know that the people who spend the MOST time at the mall chose to spend there free time listening to live music. I think it creates a calming atmosphere of sound that drowns out all of the other noise in a mall. Playing with Deep Blue is always fun and relaxing. I think it is also amazing that we have figured out how to get a full sound without the use of a bass player. Granted, it really pops when we do use a bass player, but as far as a complete sound goes, I think we have managed to get it with just drums, guitar, and sax. I suppose it is sort of like Indian music in that way. The very next day I was up early and on my way to Chicago to master the Sumkali C.D. with my good friend Ryan Staples. He was a music technology major at CalArts and now he works at a big studio in Chicago. 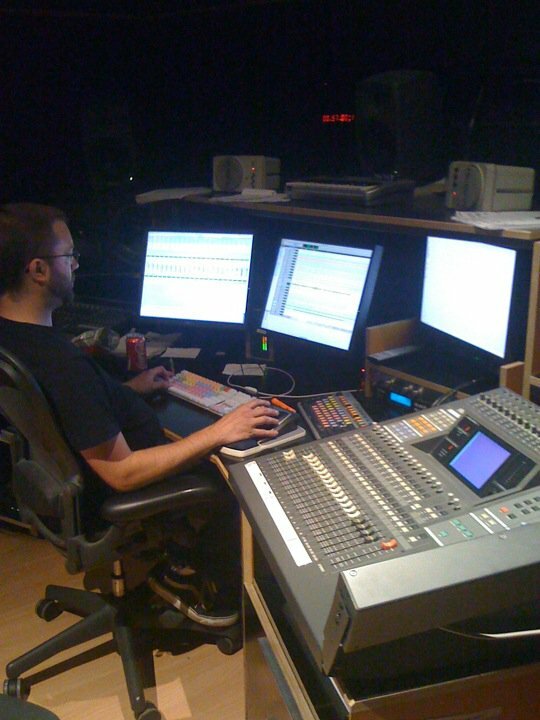 We went to his studio and spent most of Sunday night tweaking and finishing the Sumkali C.D. So now I am happy to say the audio is DONE! Yay, now it is simply a matter of putting together graphics and sending it off to the presses. By the way, our C.D. release party is at the Ark on August 26th, so mark your calendar! That is it for June. Thanks for reading and I will write again soon!